Whenever I contemplate about writing and letters, the word ‘poet’ always comes to mind. Even though poets have their way of swinging and knocking about with words, making them seem like art, poets were in my opinion the most obvious people who indoubtedly had a range of words to choose from in their lexicon when writing a letter. It is interesting to see how these words were chosen and wether they were being used subconciously or not. Having said this, Jonathan Swift had popped up in my search for a poet with a need for correspondence (as far as one can assume that it was necessary to him). I found a letter of correspondence between him and a woman named ‘Vanessa’. The letter looks like Swift is declaring his love to her, but seems to be too far away to be with her. It is quite interesting to see how he uses his words, knowing him as the writer of books and poetry. This entry was posted in Uncategorized and tagged jonathan swift correspondence vanessa. Bookmark the permalink. 3 Responses to Swift’s correspondence letters. 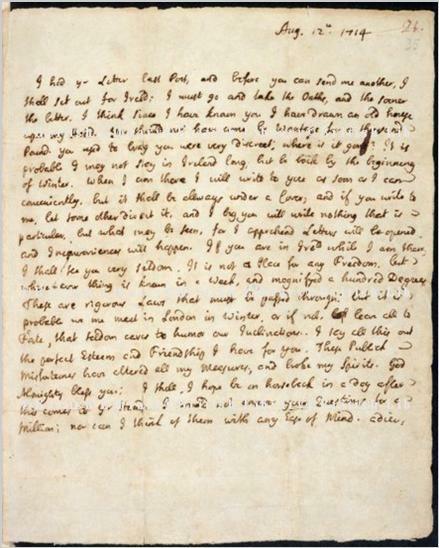 I wonder what is up with poets not starting a (love) letter with the expected opening of “Dear Whatsherface”.. Did our Dear Robert take a page out of Swift’s playbook? This letter certainly shows that letter-writing was considered a form of art by some writers. I did some research on the Internet after reading this post, and I found out that this style is called epistolary poetics. Are there any other poets whose letters belong to this genre? Was it common in England? What is the source for the letter? And who was Vanessa?